Instructor User Guide AssignmentsHow do students complete a peer assessment assignment? Select the Assignments tool from the Tool Menu in your site. If your assignment has a peer review component, the Peer Assessment for the assignment will appear immediately beneath the assignment title in the list. However, you must submit your own assignment before you can complete your peer review(s) for other students. Click on the assignment title to submit your work. Refer to How do students submit an assignment? for more information on submitting assignments. Select a student submission to review. Zoom: Select a student submission to review. 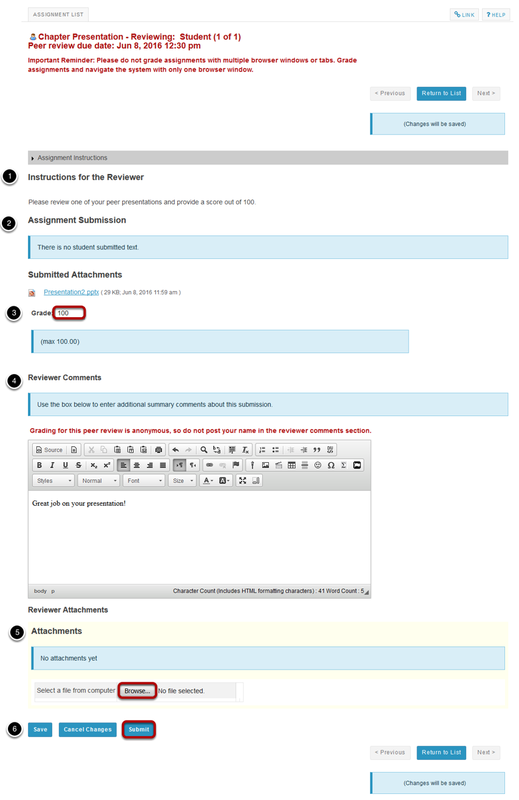 Once you have submitted your own assignment, the Peer Assessment information will display. 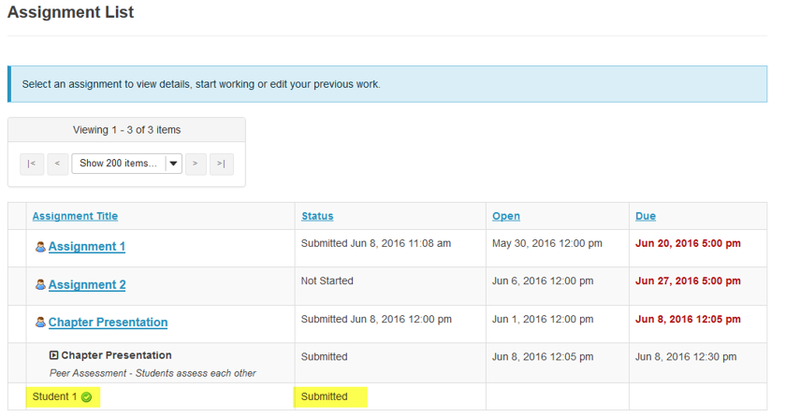 Click on a student in the list to select that submission for review. You will not see the other students' names, only Student 1, Student 2, etc. Peer reviews are anonymous. 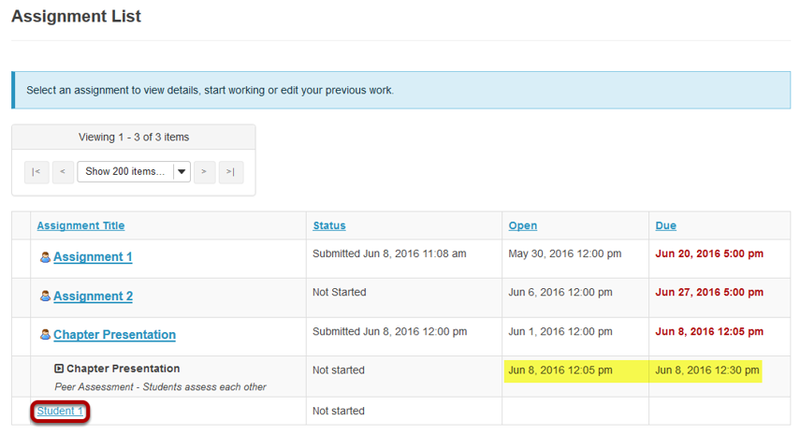 Note: The Open date begins after the due date for the assignment. The Due date is the deadline for completing your peer assessment. Zoom: Review your peer's submission. You will see the Instructions for the Reviewers provided by the instructor. The student Assignment Submission will display. 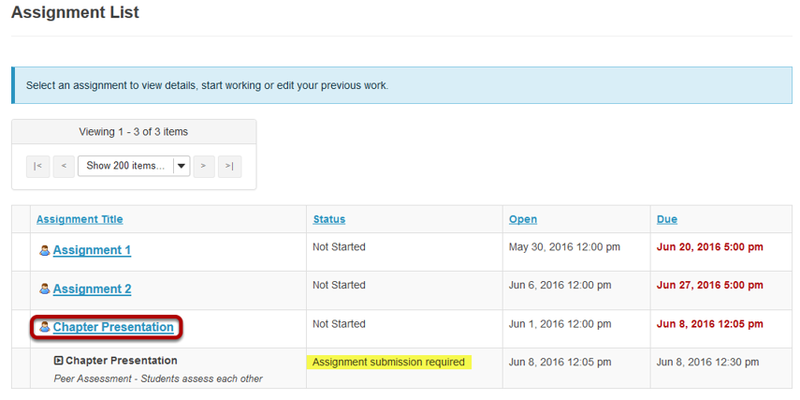 Depending on the assignment settings, you may see your peer's submission in-line and/or as a file attachment(s). Enter your grade for the peer review. Enter your feedback into the Reviewer Comments area using the Rich Text Editor. Click Submit to submit your peer review. Zoom: View submitted peer assessments. Once you have submitted your review, the status for that student submission will change to Submitted and a green check mark will appear next to the student in the list. If your instructor has specified more than one review per student, repeat the process above to submit the number of peer assessments required. Prev: How do students submit an assignment? Next: How do students view their assignment feedback?